Last year I reported on celebrating the birthday of Johann Sebastian Bach, born in 1685. I was still just barely beginning to play the flute seriously then, and I read through some music of his transcribed for flute. I have progressed tremendously on flute in the past year; the difference between having played flute for a few months and playing it for a few months plus a whole year is really huge. So this year, to celebrate, I played for myself some of Bach’s actual music written for flute: selections from his flute sonatas. 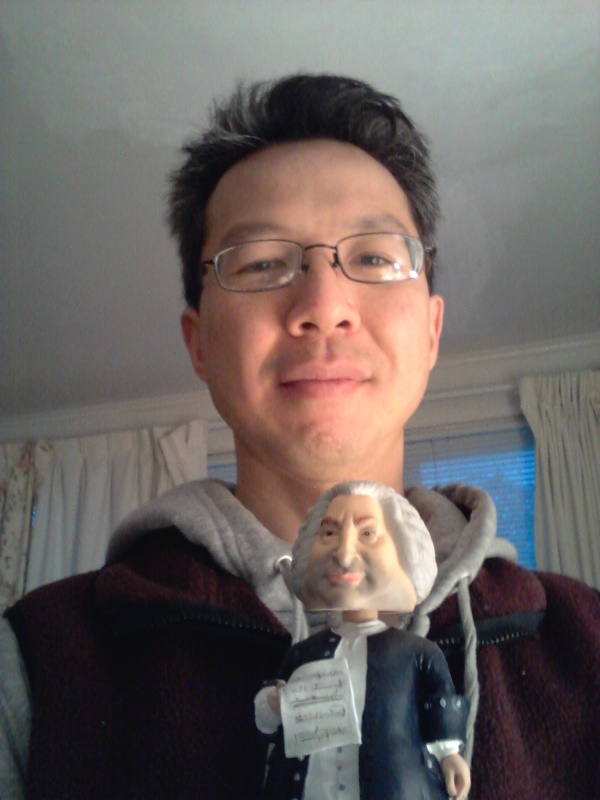 Of course, my Bach bobblehead still watches over me. I have a tale of accidental love to tell. In 2011, I started playing alto recorder, teaching myself and joining the Pittsburgh Recorder Society. I first completed the two-volume method by Orr, over the course of approximately two months, February through April 2011. Then I moved on to the two-volume method by Mario Duschenes. One of the great things about the second volume of the Duschenes method is that it contains excerpts of real music. One excerpt that came up was the first movement of Bach’s flute sonata in E major, transposed for alto recorder. I had never heard this music before, so I looked for recordings of it. This was not so easy! The reason is that I kept on finding recordings of the original flute version, but at the time, I was not yet playing the flute, only recorder, and only interested in recorder. Then I found a recording by Michala Petri and Keith Jarrett. So I worked on this adagio ma non tanto first movement and periodically played along with Petri’s recording. I couldn’t explain why, but seeing this video was one of the first times I really fell in love with Baroque music. To me, the long phrases, chromaticism, and Bach’s own style of ornamentation give a meditative expression of melancholy and longing. I poured myself into playing this on recorder, inspired by Maurice Steger’s passion for it. Baroque flute vs. modern flute? When I accidentally started playing modern flute again in late 2011, I eventually looked up actual flute recordings of Bach’s flute sonatas. I completely stopped playing Bach transposed for the recorder. I just felt that, despite Maurice Steger’s example, I could not get everything I wanted out of the recorder, and I wanted to move to flute. However, the modern flute seemed not so well suited to the music. Eventually, I bought a Baroque flute. However, because Bach on the Baroque flute has remained much more difficult for me to play than on the modern flute, I have resigned myself to mostly playing Bach’s flute music on modern flute, while trying to keep the music crisply articulated and with minimal vibrato. Here are some videos illustrating a little bit of how the sounds and interpretations may differ. I no longer like this performance as much as I did initially. It is a bit frantic, with some blazing fast playing that I would like to be a bit slower. My, taste changes in three months: I no longer like this performance. It is simultaneously still too smooth and too restrained. Bach’s birthday is a good time to remember and re-create and re-experience what was beautiful and special about the music of the Baroque era, before changes in taste and style came along in the late 18th century and onward. For me, the flute sonatas will always be a source of rediscovery and exploration of the Baroque world. I have more thoughts on this sonata.